How big can a horse get?! Well, here’s your answer. 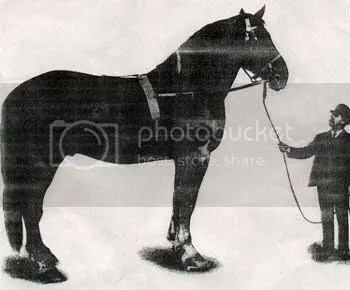 😉 Morocco, shown at the St. Louis World’s Fair in 1904, measured 21.2 hands (7’2″ or 2.18m) and weighed 2835 pounds, while a Shire named Samson (alive sometime during the 1850s) weighed in at 21.2-1/2h and 3360 pounds. 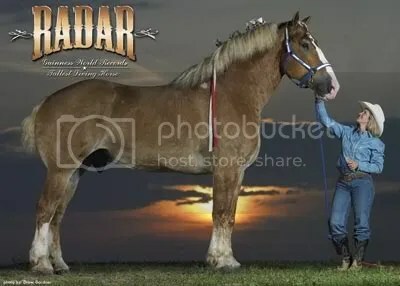 According to the Guinness Book, the current record holder is Priefert’s Radar, a Belgian gelding standing 19.3-1/2 hands (that’s 6’7-1/2″ or just over 2.01m) and weighing 2400 pounds. Aren’t you glad these animals are herbivores?! More info is available at Rural Heritage. 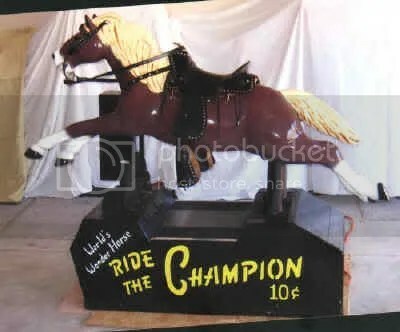 Update: there may be a challenger to the title! Link via BoingBoing. Update 2007-03-14: Article and video of Radar at the *cough* Daily Mail. LONDON’S newest monument, the Animals in War Memorial, honours the millions of conscripted animals that served, suffered and died alongside British, Commonwealth and American forces in 20th century wars and conflicts. The memorial is situated at Brook Gate, Park Lane, on the edge of London’s Hyde Park and was designed by leading English sculptor, David Backhouse. 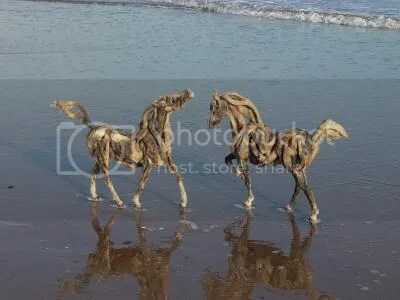 As its name suggests, it depicts the many animals that have been used by troops in wartime – horses, mules, dogs, elephants, camels, pigeons and canaries. None are forgotten, not even the lowly glow worm. For these tiny creatures were used by soldiers in the trenches during the First World War, to help them read their maps in the gloom. 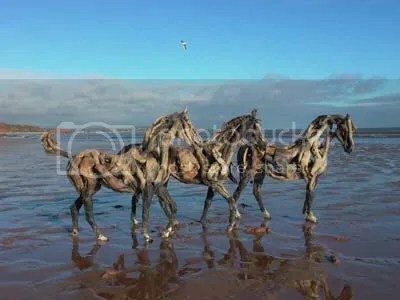 In fact, casualties number in their millions – eight million horses alone are believed to have died during the First World War, from exposure, starvation and disease, while performing their duties, carrying men or pulling loads of equipment and ammunition. Add to that the hundreds of thousands of carrier pigeons injured as they endeavoured to deliver vital information from the front. One such bird was Mary of Exeter who returned from a mission with a damaged wing and three shotgun pellets in her breast. For them and countless others like them, this is their memorial. And it comes in the form of a 55ft by 58ft curved Portland stone wall – the symbolic arena of war – upon which the animals are depicted in bas-relief. 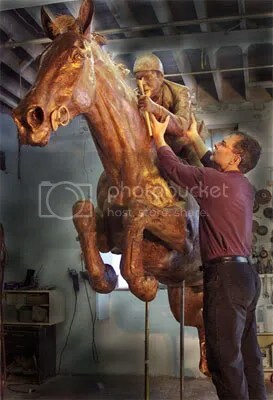 Completing the memorial are two life-size, heavily laden, bronze mules that appear to be struggling up steps towards a gap in the wall, beyond which, a bronze horse and dog seemingly gaze into the distance. 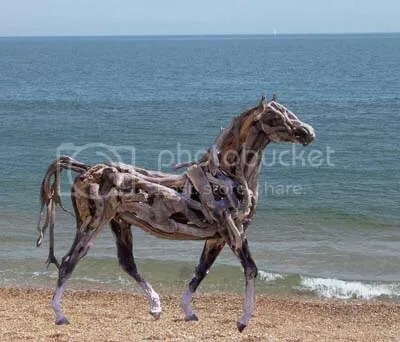 The memorial was inspired by Jilly Cooper’s book, Animals in War, and was made possible by a specially set up fund, of which Ms Cooper is co-trustee. You may also be interested in The Animals’ War at the Imperial War Museum in London. JERUSALEM – The captain who dared to "boldly go where no man has gone before" has targeted a new destination: William Shatner believes he can contribute to Middle East peace by helping disabled children through horseback riding. The former "Star Trek" actor was in Israel on Monday to promote "therapeutic riding." He hopes to raise $10 million for nearly 30 riding programs in the country. Shatner said that placing injured people on horseback has been shown to improve their conditions. "We know that the use of a horse in their therapy takes them beyond their handicapped body, their injured body, and into another area of health," he said. Shatner has long been involved with "Ahead with Horses," a Los Angeles charity that works with physically and mentally disabled children through horseback riding. He hopes his new fund, launched with the nonprofit Jewish National Fund, will contribute to Mideast peace. He stressed that every citizen of Israel, as well as Palestinians, Jordanians and Egyptians, will be encouraged to participate. Shatner and his wife Elizabeth are on their second trip to Israel, where they are visiting many of the riding centers and meeting with people that benefit from the treatment. Shatner, who played Capt. James T. Kirk on the original "Star Trek" TV series, currently stars in the series "Boston Legal." 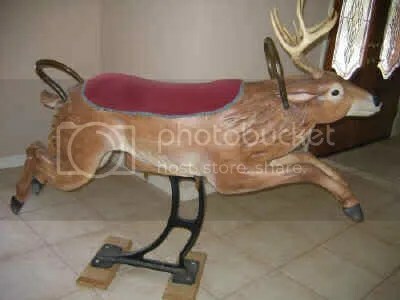 Were these your first rides? 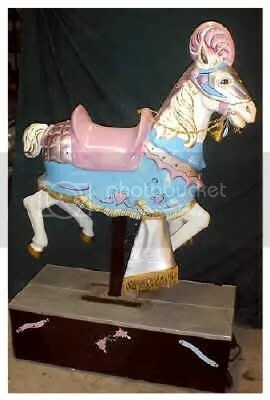 The Carousel Workshop offers cool refurbished coin-operated horses as well as carousel horses and other animals. 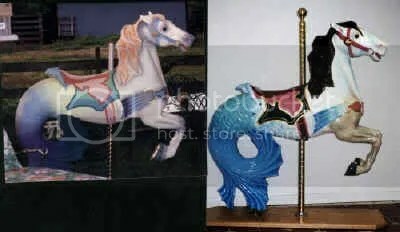 They also do restoration and repainting of these old treasures. 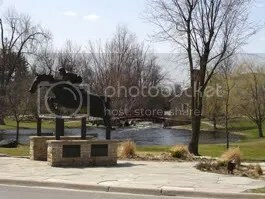 Perth, Ontario, where Ian Millar makes his home, honours one of Canada's most successful partnerships in Canadian sport and arguably the greatest team in equestrian history. The site was dedicated in September 2005 and features a life-size statue of the pair. 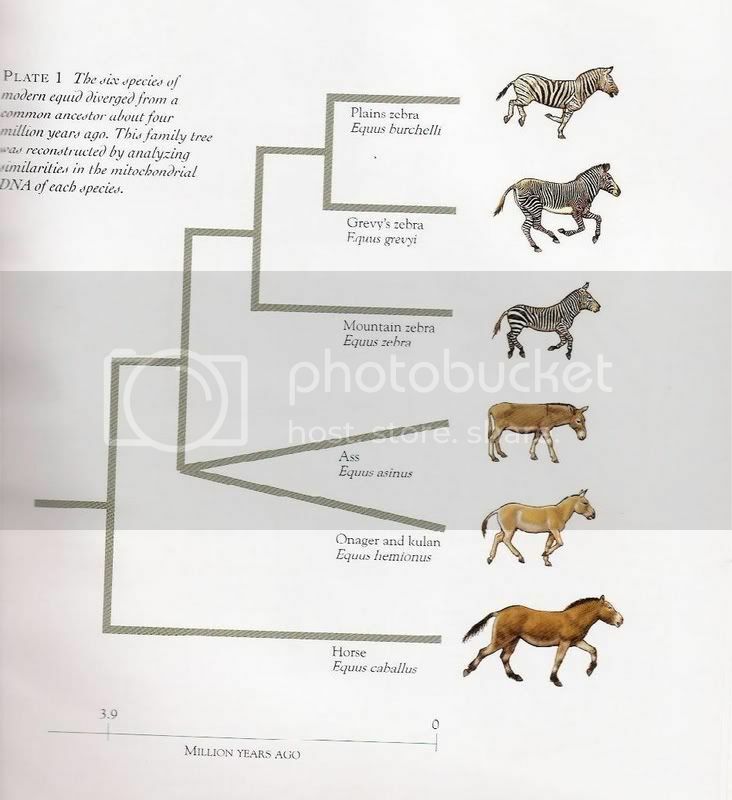 WASHINGTON (AP) — The House directed the Interior Department on Thursday to halt the sale of wild horses for slaughter, saying that was not the purpose of the program that makes the horses and burros available for adoption.The measure, part of the department’s spending bill for the 2007 budget year, prohibits the use of agency funds for the sale or slaughter of wild, free-roaming horses and burros. It was approved unanimously by voice vote. “We need to stop the slaughter of wild horses and burros not only because it is morally wrong, but also because the program itself is a failure,” said Rep. Nick Rahal, D-W.Va., a sponsor of the provision. He said the prohibition is needed to counter action by Congress in 2004 that eased animal protections that had been part of the horse and burro adoption program since its inception in 1971. Those changes opened the way for animals to be made available for commercial slaughter. 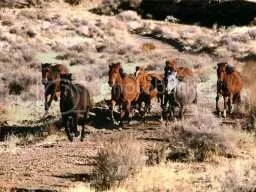 Since then, 41 wild horses have been slaughtered “and thousands more face an uncertain fate,” Rahal said. The Bureau of Land Management, the agency that manages the adoption program, has told Congress that in light of the changes made in 2004, it had little control over what happens to the animals after they are sold. Last year there were an estimated 32,000 wild horses and burros on public lands.